Ive just arrived in Malaysia and will hopefully start some voluntary work in the north in the next few days. This is after having just spent the last few weeks in India. Some was spent practicing yoga, trying to iron out all them creases which have started to appear all over me body. Part of the trip was also to find out more about the shellac business in India – India supplies around 70% of the worlds shellac, so I visited the north of the country and was the guest of the IINRG (the government body responsible for the industry). I’ll write more about this part of the trip in the coming weeks. It was fascinating and I took some great video of how it’s made. Having done a fair bit of travelling in the last few years I’ve managed to identify what I like least about travel. Not mosquitoes, nor the heat and humidity, not being hassled or hustled, not the exposure to poverty, not the blatant police corruption you find in some places, not the filth, not the disgraceful drunken or loutish behaviour of my fellow travellers,…no. What I really don’t like is luggage. I don’t like carrying it, packing it, unpacking it, looking after it, worrying about it,. When it comes to flying, I like it even less: paying for it to go in the hold, checking it in, waiting for it, worrying about wether it will turn up, wether it might have been damaged, stolen or lost. I don’t even like standing around the carousel to collect it. There’s not much I like about luggage. Luckily it turns out I’m a bit of a minimalist. It makes no difference these days if I’m going away for a weekend or 6 months. I take hand luggage only. If it doesn’t fit in this little bag, it doesn’t come. It’s not as hard as you might imagine. First, when travelling I tend to pick a spot and stay a while. Often a month or two or three. That means when I arrive in a place and find a room (booking ahead only in destinations that tend to be expensive) I pop to the shops and buy half a dozen pairs of underwear and three or four t-shirts) I wear them for the duration of my stay and then donate them to a charity or someone on the streets when I leave. They’re cheap enough when your in the east. So you don’t need to take much. Specs – reading and sunglasses. What isn’t in the bag, or in the picture are a pair of flip flops (“thongs” if you’re an Australian.) again, this is something I pick up cheaply on arrival. Then there is the clothes you can see – the ones I wear to travel in: my good jeans, I tend to travel in fairly respectable clothes, it seems to make life easier, or at least people call you “sir” whilst overcharging/short changing you, which is only fair. A nice shirt – again, handmade in India, I go back to the same chap each year, he does a great job, and makes me a few new shirts every year. My brogues – ah my brogues. You can’t beat a decent pair of English brogues, though they’re probably made in India or somewhere. And yes, I do travel with a pair of shoe trees. Apart from sometimes causing confusion at airport security, these things are essential if you want your shoes to last. And I think these brogues of mine are getting on for ten years old, so they certainly do the job. 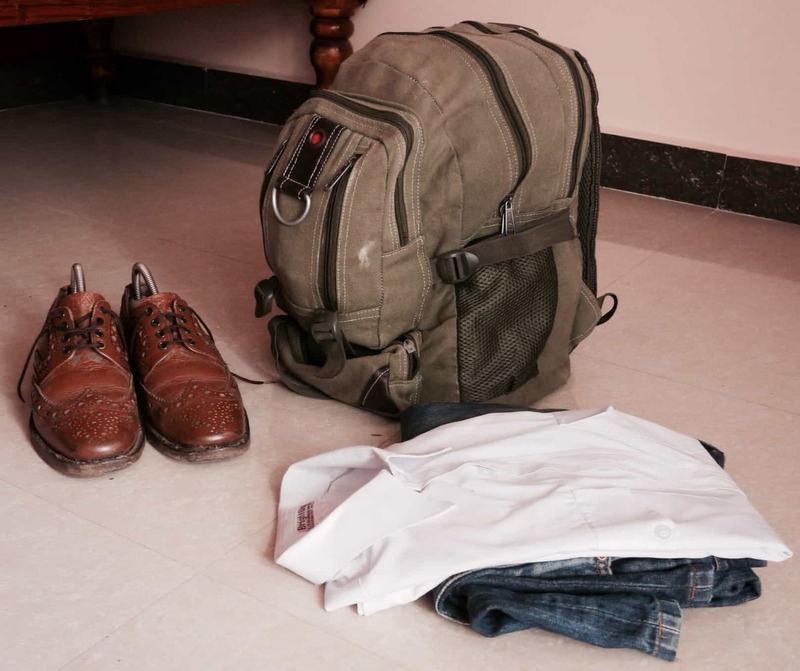 Good shoes, and decent-all-covering clothes come in handy in the evenings to keep the mosquitoes at bay, and again since I go from place to place over a few months it’s handy to have casual clothes for casual places, and smarter clothes for smarter places. Don’t want to make a fuss do I? And it’s quite possible to do both with just hand luggage. A kindle. Marvelous invention. Be lost without it. Don’t buy books. You have to carry them, and it’s never worth it. An ipad2. Bought it second hand last year in Bangkok. Don’t buy a new one. Here made of glass, and I promise you, they don’t bounce very well. But they are clever. I do all my writing on this thing, as well as many other useful things. It’s getting to the point where you really could run a business from one. What I need is a”guitar making app” and I could put my feet up! Camera: a Panasonic GF1 that I bought last year. The best 4/3 camera ever made. Or so I’ve been told. It’s good though. The down side is all these things need a charger, so add a bag of wires and a travel adapter and you’re done. And the bag? Bought in India last year when the previous years bag finally took a well earned retirement. Yes, “Flashpacker” stick it in Google, see what comes up….